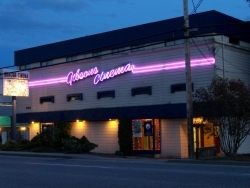 A Sunshine Coast BC directory of Gibsons Movie Theatres. Located in the town of Gibsons BC. Gibsons Cinema is located at 909 Gibsons Way - Join us for the latest releases of your favorite stars. The theatre itself features 214 seats and has a marvellous original wood stage capable of handling live acts. Check out NOW PLAYING for current features and times. Call 604-886-SHOW to reach Gibsons Cinema! For current movie listings and times, click on the NOW PLAYING link in the yellow Gibsons Cinema ad above. If you are looking for a movie theatre in another Sunshine Coast BC community, be sure to check the other Service Directories from the Sunshinecoast-bc homepage.